The stage is simply brought outside for the open-air theatres. The feeling of summer combined with dramatic performances possesses an irresistible appeal. With more than 900,000 visitors, the Lake Thun Festival proves how popular open-air performances are. 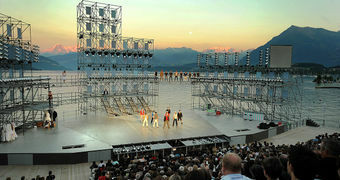 Performers and scenery compete for the audiences’ attention during the event, which also calls itself Europe’s most beautiful lake stage. 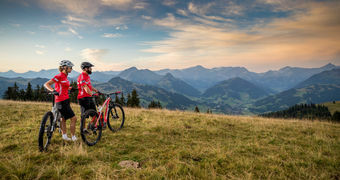 Located between Lake Brienz and the big three mountains of Eiger, Mönch and Jungfrau, the organisers entertain their guests with international hit musicals, such as Cats, West Side Story or Mamma Mia. The premiers at the Gurten Theatre in Bern, however, are full of local colour. Surrounded by nature, comedies, such as “Einstein” and “Der Scharlatan” (the charlatan), are performed in Bernese German and create a good mood among their audience. Visitors to the Gürbetal Summer Theatre experience inspiring contrasts. The modern stage design is embedded in a tuff mine and regularly offers exciting performances. Switzerland’s history is brought to life with the “Tellspiele”. Every year in Interlaken, the life of the Swiss folk hero Wilhelm Tell is performed on stage in a new adaptation. However, one thing hasn’t changed since 1912: the Freedom Song has its firm place on stage. But this is not all the region has to offer in summer. Visitors are spoiled for choice with the Waudbüni Hohfure, a theatre set in the middle of a forest and even featuring its own restaurant, the Landschaftstheater Ballenberg, an open-air theatre established in 1991, and the Freilichtspiele Moosegg whose plays have a close link to the Emmental region.